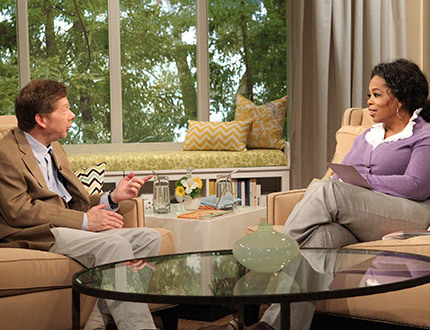 Yesterday, Oprah invited Eckhart Tolle to catch up, reflect and have a Super Soul Sunday conversation. Throughout the telecast, Eckhart was in excellent form as he reviewed many of the topics in his books, The Power of Now and The New Earth. His main purpose in writing these books was to cause an awakening. If we don’t awaken, the problems caused by unawakened minds will increase and multiply. He provided insightful and, sometimes humorous, answers to questions from Oprah and the viewers. Q. How do you accept an unpleasant situation, if change is not possible? A. You must accept a situation, even if change is not possible. The basis for effective enlightenment is to come in alignment with the present situation. When you accept the “isness” of life, greater intelligence arises. If you are angry and resist the unpleasant situation, you will remain stuck in it. Q. How do you calm the voice in your head? A. This question implies you know that your mind can’t stop. This is a good first step. Take the energy away from these thoughts, by asking yourself if you can feel the energy in your hands. Wait and you will feel it. Then move to your legs and other body parts. The inner body serves as a wonderful anchor for a sense of presence. This allows you to be distracted from your other thoughts. Q. How does one clear the mind of bad memories? A. Recognize that these memories are thoughts only in your head. They are not realities because they have already happened. Q. How do you have fun? A. I enjoy the present moment wherever I am and that’s fun for me. A. I am in a state of peaceful aliveness. Q. What are you grateful for? A. I am grateful for always this moment…the now, no matter what form it takes. You are not your thoughts. You are the awareness of thoughts disguised as a person. Only spirit can recognize spirit. If you identify with every thought in your head, you are not ready to hear the message. Guilt is a strong way for the ego to strengthen itself. You don’t have to believe every thought that comes into your head. The answer doesn’t always come in words. It often reveals itself as awareness. Stillness is the language that God speaks. Everything else is a bad translation. This entry was posted in Inspiration, Super Soul Sunday and tagged Eckhart Tolle, Joanne Guidoccio, Oprah, Super Soul Sunday, The New Earth, The Power of Now. Bookmark the permalink. I love that others love him as much as I do. I have only two friends here in my present world that ‘get’ him and one introduced him to me. Thanks for this. I hadn’t seen it. After listening to him, I always feel so calm and peaceful afterward. I’m convinced he’s one of our modern-day saints. Thanks for dropping by, Cindy. Great article! You can’t go wrong with Oprah and Eckhart Tolle!!!! Thanks so much for sharing!! !